This set of pot and box ball is perfect if you want something that not only looks good, but can occasionally be moved around on the patio. The pot is made from 100% weatherproof resin and has a taupe finish. The pot measures 30cm wide x 22cm high and has a 7-litre capacity. 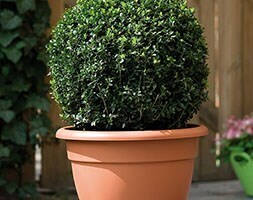 The box ball (Buxus sempervirens) is currently in a 5-litre pot and has been clipped to form a 30cm ball. When potted up it will be a great fit for the pot - ready to create instant impact. Please note: the pot mover shown is not included. Garden care: Ensure that the soil or compost is never allowed to dry out. Trim plants grown as hedges or topiary in mid- or late summer. If you want to maintain a really precise outline, then you can clip it twice a year - once in June, and then again in August/September. Apply a top-dressing of a balanced slow-release fertiliser such as blood, fish and bone (organic) or Osmocote (inorganic) around the base of the plant in spring, making sure that none touches the leaves or stems.